Immigrants on deck of steamer “Germanic.” Unknown photographer, 1887. Refugees must repay the cost of the airfare to the United States. Although the government does pay for the flights of refugees to the US, that money is an interest-free loan which must be repaid as soon as the refugee begins to earn an income. That money is then funneled back into a fund that pays for additional refugees to be brought over. Studies show that although there are costs involved in resettling refugees, the positive contribution they make to the economy balances out the expense. Money is spent mostly to provide social services like language and vocational training, healthcare and cash allowances. One study showed that in Cleveland, where 4,518 refugees were resettled between 2000 and 2012, 38 new businesses were started, yielding an additional 175 jobs and $12 million in spending in Cleveland in 2012. Refugees must prove their status. 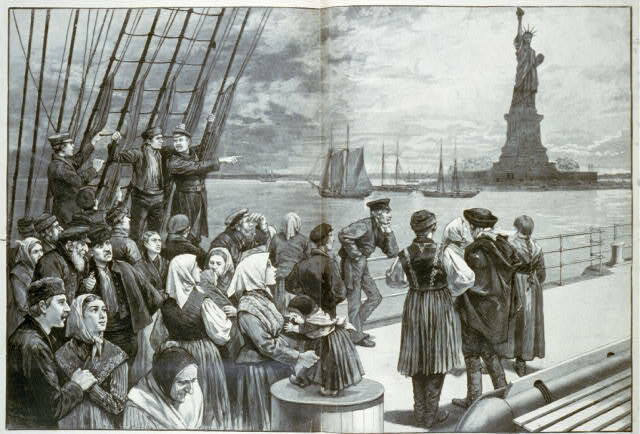 International law states that a refugee is someone with a “well-founded fear of being persecuted for reasons of race, religion, nationality, membership of a particular social group or political opinion, is outside the country of his nationality and is unable or, owing to such fear, is unwilling to avail himself of the protection of that country; or who, not having a nationality and being outside the country of his former habitual residence as a result of such events, is unable or, owing to such fear, is unwilling to return to it.” Being poor is not enough. The process of resettlement is a long and arduous one. According to the World Bank Group, the average length of time a refugee waits in “limbo” until he is resettled is 10.3 years. The median is four years until a permanent home is found. Once the process of resettlement in the US begins, the minimum amount of time it takes is 18 months. Immigration lawyers say that it is not unusual for the process to take from four to eight years. Louisiana’s Republican Senator David Vitter sent a letter on September 29, which was viewed by Reuters, to John Stumpf, chief executive of Wells Fargo, asking him to provide a “full accounting” of customers affected by their improper sales practices. 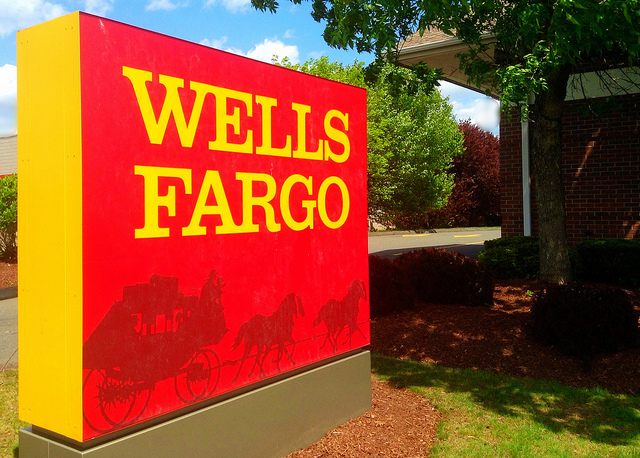 Investigations by Vitter’s committee can point to Wells Fargo’s fraudulent practices being directed to about 10,000 small businesses in addition to the possible 2 million consumer accounts which Wells Fargo opened fraudulently. This new revelation comes about one month after the bank reached a settlement of $190 million with its customers for opening accounts for them without their knowledge. The news of the bank’s behavior caused a sensation among consumers, resulting in the firing of about 5,300 employees for opening up accounts improperly. Stumpf appeared before two congressional committees, and other oversite governmental authorities such as the Justice and Labor Departments, which led to investigations into the bank’s sales practices. But a Consumer Financial Protection Board spokesman said Langan’s words were incorrect. The two million accounts in the settlement did not included any small business accounts. Unilever PLC, the European consumer products powerhouse, agreed to purchase Seventh Generation Inc, maker of environment-friendly detergents and household cleansers, for $700 million. The London-based giant, known for its popular brands such as Dove soaps and Axe deodorants, is looking to gain a toe hold into the growing market for “natural” cleaning products. Unilever had been in preliminary talks with a different company, Jessica Alba’s Honest Co. Actress Alba’s company claims to avoid any harsh chemicals in its cleaning products. Honest Co’s asking price was $1 billion, but the deal seems to have fallen through and is unlikely to happen. Seventh Generation was founded in 1988 and is based in Vermont. The company has been growing steadily, and had sales of over $200 million last year. In 2007 an investment deal valued the company at $100 million. The IRS may be heading for a fight with taxpayers as a result of proposed regulations which are meant to limit certain estate and gift tax planning strategies. The regulations (REG-163-113-02) were issued on August 2nd, and they place restrictions on the use of “valuation discounts” which have the effect of lowering the overall value of assets in family-owned businesses. As a result, the decedent’s estate’s value, and therefore the gift tax liability, are reduced at the time of death. The way the IRS achieves their goal is by disregarding the limitations that allowed taxpayers to use such discounts before. Yet the Tax Court could uphold the new regulations. The deference doctrine that was established 30 years ago by the Supreme Court decision of Chevron USA Inc versus Natural Res. Def. Council could be the precedent for upholding the regulations.